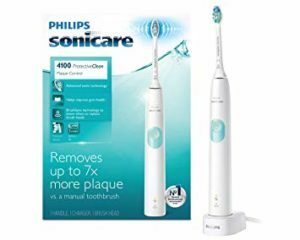 The Philips Sonicare ProtectiveClean 4100 is a nifty, affordable little electric toothbrush that’s 7 times more effective at getting rid of dental plaque than a manual toothbrush – and comes with some handy features often seen only with premium models. If you’re in a rush, check out the answers to these 3 big questions in this Philips Sonicare ProtectiveClean 4100 review that should give you enough information to make a smart choice. For more details, read the entire Philips Sonicare ProtectiveClean 4100 electric toothbrush review right here. 1. Is there any serious problem with the Philips Sonicare ProtectiveClean 4100? None at all. 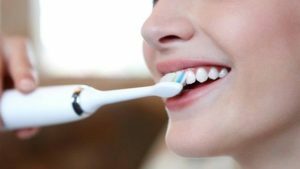 In fact, this popular model has all the cleaning power needed to qualify as an excellent electric toothbrush choice for a budget-conscious buyer. 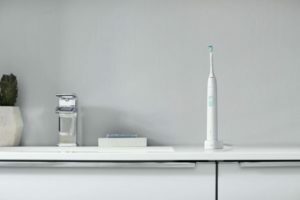 The model offers features not often found in low priced toothbrushes, like a built in timer, pressure sensor and an intelligent brush head reminder system. No surprise, then, that the Philips Sonicare ProtectiveClean 4100 is popular with discerning customers who want quality at a great price. 2. What other alternatives exist to the Sonicare ProtectiveClean 4100? In terms of specific functionality, the Philips Sonicare ProtectiveClean 4100 is pretty unique because of its BrushSync feature. A few other models with comparable efficiency that you might consider are the Sonicare EasyClean (which is an older model, and doesn’t have quite as many features as the Philips Sonicare ProtectiveClean 5100) and the Oral-B Pro 1000 (which is less expensive, but also has limited functionality by comparison). 3. Where to buy the Philips Sonicare ProtectiveClean 4100 electric toothbrush? As with any other electric toothbrush, you have the choice between getting it offline in a store or supermarket chain, like Target, Walmart or any other… or ordering it online. We suggest Amazon for your best option since the prices are usually the best you can find anywhere online, and there are frequent deals and discounts that can bring down your cost significantly. If you shop around, you might find other sites offering coupons or special offers which can add extra accessories or slash the price further. Why Trust ‘A Dentist’s Daughter’? The electric toothbrush reviews we publish are unique in a way, because we craft them from your perspective, as a buyer. Look, we’ve been doing this for a long time. Over the years, we’ve reviewed a wide range of brands and models. We run extensive analysis on each toothbrush, and our reviews are often detailed and dive deep into studying the features and elements of value to you. The goal is to make you an empowered consumer who can get quick and easy access to the most essential information, in order to decide intelligently about which electric toothbrush is right for your needs. If you haven’t yet read it, check out our Buyers’ Guide for the Best Electric Toothbrush. You’ll learn all about the most vital features to consider before purchasing your toothbrush. Now before we get any further, a word of explanation. We aren’t funded or sponsored by any big brand or corporation. We aren’t dentists or dental hygienists ourselves. This isn’t medical advice. You should always go by what your dentist recommends for your oral hygiene. So please check with your dentist and only then make a final choice. This becomes even more important if you have any dental problems or have had dental work done in the past. Okay, with that out of the way, let’s take a deeper dive into the details of the Philips Sonicare ProtectiveClean 4100 electric toothbrush and look at what makes it such a popular favorite of thousands of owners. 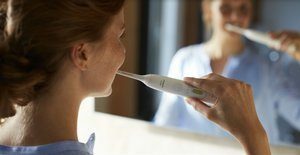 Philips Sonicare is one of the best known brands in the oral hygiene marketplace, having been around for ages and delivered consistently high value through a range of dental care and cleaning products including some amazingly popular electric toothbrushes. The Philips Sonicare ProtectiveClean 4100 is no exception to the general rule that you can’t go wrong with a Sonicare toothbrush! The model is relatively new, having launched in the summer of 2018 after some major technological improvements were made to the earlier version. And after these changes, incredibly enough, the price was lowered! How many kinds of Philips Sonicare ProtectiveClean 4100 toothbrush are there? Well, the Sonicare 4000 range is among the more diverse Sonicare electric toothbrush models out there. Several different kinds of instrument are available, each with its own unique features and specialties. Within the Philips Sonicare ProtectiveClean 4100 stable, all the variants are technically identical, differing only in the color of their brush handles. The options are to get this toothbrush in Black Grey, Navy Blue, Light Blue, Pastel Pink or Deep Pink. It makes things a little confusing, though, when each is assigned a unique part number by the manufacturer. There’s also a pack with dual handles, so make sure when you’re ordering that it’s the right one you want. The ‘family pack’ includes 2 brush handles, brush heads, a charging stand and travel case, which is delightful if you’re a family who loves to travel. However, if you analyze this package carefully, you’ll realize that it’s actually less expensive to buy two standard packages than the dual-handle one! A word of caution: All variants may not be available with a particular stockist. If you’re bent on getting a specific color only, be prepared to wait – or shop around until you can find one. What’s included inside the package? What makes the Sonicare ProtectiveClean 4100 a good choice? Design: The toothbrush feels comfortable in your hand, and comes in a range of appealing colors to match your taste. Cleaning: There’s just a single brushing mode, but you can run it at two levels of intensity depending on how much cleaning you desire. Timer: To ensure that you don’t miss out on any teeth, the inbuilt timer reminds you every 30 seconds to change quadrants. BrushSync: Reminds you that it’s time to change your brush head, thereby ensuring you get the best value from your brushing. Battery Life: Excellent, and quite surprising for such an affordable toothbrush. What’s not so hot about the Philips Sonicare ProtectiveClean 4100, though? Pressure Sensor: It doesn’t offer a visible indication, such as turning on an orange light, to let you know you’re pressing too hard on your teeth. Price: Though not very expensive, the Philips Sonicare ProtectiveClean 4100 is still on the higher side of a ‘budget’ toothbrush. Extras and Accessories: This is a no frills toothbrush, with not even a few spare brush heads thrown in. The design excellence of this Philips Sonicare ProtectiveClean 4100 electric toothbrush is apparent right from the packaging, which is made from recyclable material and wastes little, if any. When you hold the Sonicare ProtectiveClean in your hand, it just feels right! It’s the kind of sense you get from a premium product, and distinctly superior to any of its competitors. The detachable brush head and handle are nicely crafted. The handle is rounded, and looks just like any other electric toothbrush. It is easy and comfortable to hold securely while brushing. There are 5 color options, although the charger and stand come only in white. The power button is situated a third of the way down the handle. It is concave, made of rubber, and clearly labelled. Near the bottom is a BrushSync LED and below it the battery indicator LED. A neat design element, representative of the kind of thought and planning that goes into the creation of a Philips Sonicare toothbrush, is a ridge or notch on the back of the handle. This helps keep the brush from rolling off when placed lying flat on a table or sink, even if you accidentally knock it. The handle’s base is flat to allow the toothbrush to stand erect, and has a recess in it for the charging stand to fit. Near the top of the handle is a metal shaft to which the Sonicare brush head must be attached by clipping it into place. The shaft is attached within to the rotatory motor that powers the toothbrush. The brush head itself is angled slightly to allow easier access to the area behind your last molars. Although the Philips Sonicare ProtectiveClean 4100 electric toothbrush only operates in one cleaning mode, it is powered by a forceful internal motor that ensures the brush head vibrates at 31,000 times a minute. While some might consider the lack of advanced brushing modes to be a drawback, there’s something to be said for the simplicity of having just one mode. For most users, this is adequate and having extra options only makes operating the electric toothbrush more complicated. Also, there are no complex LED indicators or design intricacies to let you know which mode is currently active. You can run the Sonicare ProtectiveClean in one of two intensity settings – high and low. This gives you some control over the vigor with which you’ll clean your teeth. Other brands use the catchier names ‘Clean‘ and ‘Sensitive‘ for similar settings. The gentler low setting is particularly helpful for those with sensitive gums or teeth. It’s simple to turn on the toothbrush by pressing down the power button. Another push changes the intensity setting. To turn off the toothbrush, press the power button and hold it for a few seconds. Even if you don’t, the brush will turn off automatically after some time. Everything is intuitive and easy to learn. A nice feature is the inbuilt timer that helps ensure that you follow a typical dentist’s recommendation to clean your teeth for two minutes, twice every day. The Quad-pacer function indicates when 30 seconds have passed, so that you can shift from one quadrant to the next, thereby making sure that all your teeth are equally clean. Once you learn the right technique to clean your teeth using the Philips Sonicare ProtectiveClean 4100 , you’ll begin to enjoy the real cleaning efficiency of this brilliant device. The brush head is best held at a 45 degree incline to your teeth. 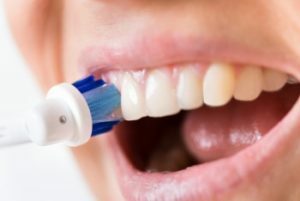 As the sonic effect set up by 31,000 oscillations per minute, the bristles skim the surface of your teeth, dislodging food particles and germs from in between and behind teeth. A pressure sensor serves to let you know when you’re pressing too hard on the teeth, so that you can ease up and avoid damage to the enamel. You’ll quickly learn how much pressure to exert for optimal cleaning. If you ignore the warning, the toothbrush will automatically turn off, or lower the power intensity. The only minor drawback that some might point at is how there isn’t a visible indicator of too much pressure, such as a blinking or bright light going on as with the Sonicare DiamondClean toothbrush . 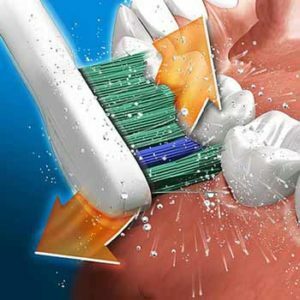 Not only can brushing too hard potentially injure your teeth, it also wears out brush heads faster. The average Philips Sonicare ProtectiveClean 4100 brush head lasts 3 months, which means 4 annual replacements will be necessary. The BrushSync system informs you when it’s time to swap brush heads. With most Sonicare toothbrushes, the fading of bristles to a very pale near-white color signifies that the head needs replacing. But the Philips Sonicare ProtectiveClean 4100 has a stunning BrushSync feature based on a microchip embedded in the brush head. When you first attach a new head to your Philips Sonicare ProtectiveClean 4100 electric toothbrush , the chip is detected as 3 brief flashes of a warning light flash. Now the system’s electronics will monitor usage. When the technology measures that the brush head has been used for 3 months, the LED on the handle lights up an orange color to indicate that the brush head needs changing. This isn’t just a ‘duration‘ based measurement. If you brush more frequently on a regular basis, or use excessive pressure while cleaning your teeth, or run the electric toothbrush continuously at higher speed settings, then BrushSync will alert you sooner as the bristles will wear out sooner. In the same way, if you use the toothbrush more sparingly and gently, then it might not suggest a replacement for 4 months, or even longer. This is a great example of how technology can be harnessed for a user’s benefit. Speaking of brush heads, there are different kinds that are compatible with the Philips Sonicare ProtectiveClean 4100 toothbrush. Some are specifically tailored for effective plaque removal, while others are best suited for whitening teeth or keeping your gums healthy. So how does it feel to brush with the Philips Sonicare ProtectiveClean 4100? Your teeth will feel super clean, and this effect usually continues for months of using this lovely toothbrush. No wonder so many delighted owners use their device daily for extended periods of time. It’s a pleasure to clean your teeth with the Philips Sonicare ProtectiveClean 4100 electric toothbrush. And a large part of this comfort comes from tiny tweaks designed to help a beginner get used to the instrument. EasyStart is one of these systems. Over the first 14 times you brush with a new Sonicare ProtectiveClean, the intensity of your brush will gradually increase – automatically. This is in order to help new, first-time users of an electric toothbrush to get used to the novel experience. Some people are scared at the ‘buzzy’ noise or vibration felt inside their mouth, and starting off with too powerful a setting could cause them to lose interest entirely. This toothbrush comes with a plastic travel case with interior mounting points to which the brush heads and handle can be affixed. It’s small enough to fit comfortably into travel bags, and the plastic shell is hard enough to protect your toothbrush against any injury and accidental turning on. Battery power is decent. A rechargeable lithium ion battery typically powers the brush for around 56 minutes of usage. With regular use, this translates into 2 weeks of activity following a full recharge, which is fantastic for most kinds of regular use. Waning battery power is indicated by an LED on the brush handle. When the battery is full, it glows a solid green. Flashing green light indicates the battery is half-way charged. Flashing amber and three beeps remind you that the battery is down and needs early recharging. As soon as you’re notified of the weak battery, pop the brush handle onto a charging station and leave it overnight. Two beeps inform you that the recharge is underway. Throughout the time it’s charging, the battery level indicator will flash. The battery will be fully recharged within 24 hours, and the light glows a solid green for 30 seconds before turning itself off. The Philips Sonicare ProtectiveClean 4100 electric toothbrush is water resistant, but not completely waterproof. It is not recommended to use the device in a bathtub or shower. A two year warranty safeguards you againt manufacturing errors and other flaws. User induced damage due to accidentally dropping or immersing the toothbrush in water isn’t usually covered. Where can you buy the Philips Sonicare ProtectiveClean 4100 electric toothbrush? 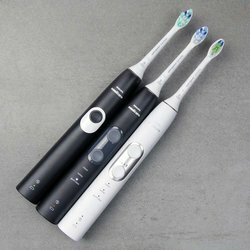 This electric toothbrush is available in stores like Target and Walmart, as well as online retail e-commerce platforms like Amazon and eBay. Price is usually a sticking point for many buyers. Online vendors generally beat out offline stores because they offer year-round discounts on retail price that range from 25% to 65%. However, you might get great rates even in offline stores around the holiday season. A slightly different question (but one just as important for a buyer) is whether the Philips Sonicare ProtectiveClean 4100 is worth the price. In a market polarized between the sub-$30 basic electric toothbrush models like Oral-B 1000 Pro and the super-expensive Philips Sonicare DiamondClean , it can make you wonder if you’re really getting extra value from a device somewhere in between these extremes. This may even explain the price drop of certain Sonicare models to make them more affordable to a consumer in search for some features and benefits, yet unwilling to spend $200 or more on a toothbrush. The Philips Sonicare ProtectiveClean 4100 is one of these, where innovation comes at a cost – but not a very high one. Most newly launched models tend to be higher priced than you might expect. If a model you like seems too costly for your wallet, a good plan is to wait for 3 or 6 months and then check back again. Chances are you’ll find it available at a lower price than before, even upto 60% lesser at times. The problem? It’s hard to tell how long it will take for this drop to come. So should you buy one at current prices? That’s a question only you can answer, and hopefully this Philips Sonicare ProtectiveClean 4100 electric toothbrush review was helpful in making your decision. Whenever evaluating the cost of ownership of a new electric toothbrush, don’t forget to factor in the expenses of replacing brush heads. As we’ve already discussed, expect to replace brush heads every 3 months or so – and add this projected cost to your estimate. Expect to pay around $7 per replacement head for the ProtectiveClean 4100, and nearly twice as much for premium BrushSync heads. Your toothbrush itself will last for around 5 years, maybe even longer if you take good care of it. Assuming that your brush will last for only 3 years, the average cost of ownership works out to roughly 15 cents per day. If the handle is shared between multiple users, this cost drops further. Your Philips Sonicare ProtectiveClean 4100 electric toothbrush will last for a good 3 to 5 years with proper use, just like the Sonicare Essence electric toothbrush most other models in the Philips Sonicare stable. This is what makes the brand so reliable and popular among customers. By its nature, an electric toothbrush is exposed to constant motion and dampness/moisture, which could damage internal parts in the long run. The design of ProtectiveClean 4100 is so good that leaks are rare. And in the off chance of a manufacturing defect, the toothbrush comes with a 2 year manufacturer warranty. All you have to do is register your purchase online, and in case something goes wrong, the company will replace your faulty device with a better one. The Philips Sonicare ProtectiveClean 4100 is a good electric toothbrush choice. It cleans well, is comfortable to use, durable and sturdy, is backed by a trusted and reliable company and offers enough features to keep the most demanding buyer happy. Of unique value are the inbuilt timer, Quad-pacer technology, EasyStart functionality, and BrushSync replacement reminder. Excellent battery life is just icing on the cake. And if you can afford the mid-level price, this is an excellent option for most users. Q: Is this an oscillating toothbrush? A: No, the Philips Sonicare ProtectiveClean 4100 is a sonic electric toothbrush that cleans through a vibratory ‘vortex generating’ action. Q: Are there multiple cleaning modes for specific needs? A: The ProtectiveClean 4100 has only a single mode, but can run at two levels of intensity – high and low. Q: Are there extra brush heads included? A: No, there’s only one brush head in the package, a C2 Optimal Plaque Defence brush head. But you can purchase extra brush heads separately. The instrument is compatible with a range of other Sonicare brush heads. A: Yes, the Philips Sonicare ProtectiveClean 4100 comes with a pressure sensor, but it doesn’t give a visible indication, simply reduces power when you press too hard. A: No, this doesn’t have Bluetooth. Q: Does it have an automatic timer? A: Yes, the Sonicare ProtectiveClean 4100 electric toothbrush has an inbuilt timer to indicate every 30 seconds that it is time to shift to another quadrant (QuadPacer) and let you know after 2 minutes (which is what most dentists recommend for cleaning teeth). Q: How long is the manufacturer’s warranty? A: The Philips Sonicare warranty is for two years and safeguards a buyer against manufacturing flaws and defects. Q: Does the battery hold charge well? A: Yes, you’ll get around 2 weeks of active brushing (56 minutes, on average) for each full recharge. The device comes with a charging station included. Q: Can the charger be wall-mounted? A: No, it must rest on a flat surface. Q: Can I use the Sonicare ProtectiveClean 4100 in the shower? A: While the toothbrush is water resistant, it is advisable not to use it in a shower or bathtub. Q: Is this toothbrush travel friendly? A: Yes, it is easy and convenient to carry along with you on trips. There is a travel case included in the package. Q: Is it easy to operate the Sonicare Protective Clean? A: Turning the ProtectiveClean on and off is simple, and is done by pressing the button on the front of your handle. A short beep indicates the motor is turned on. Indicator LEDs also will blink thrice and then glow to confirm activation. So, was this Philips Sonicare ProtectiveClean 4100 electric toothbrush review helpful? Do you feel you now have enough information about it to make an empowered buying decision? 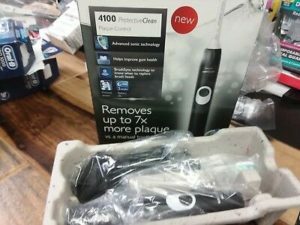 If you already own a Philips Sonicare ProtectiveClean 4100 or have decided to buy one after reading this review, please share your thoughts about it here.